Blog Factory is a user friendly, webmaster friendly blogging extension for Joomla. Full of features, it is a well thought alternative to Wordpress blogging, allowing you to use Joomla versatility and well known blogging conventions such as Bookmarking Sites. 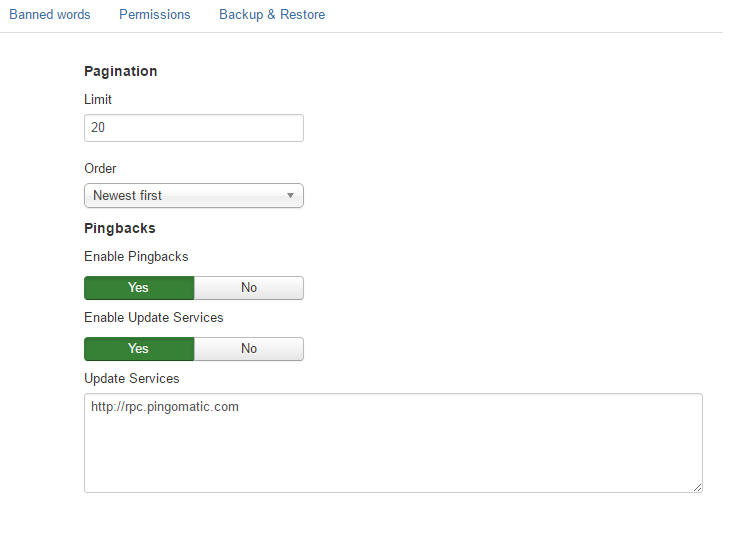 To enable this and to configure many more settings go to Components/Blog Factory/Settings. With Enable Router Plugin you will have short URLs for posts and blogs. Other SEF components/plugins must be disabled in order for the plugin to work correctly and Search Engine Friendly URLs must be enabled. After enabling this feature and saving, all posts and blogs aliases will be generated uniquely. Posts can also be sorted by categories with the Enable categories feature, you can configure these categories within the component. Webmasters can now decide whether blogs can be bookmarked or not with the Blog bookmark option. Bookmarked blogs can be accessed on the frontend by pressing the "Manage bookmarks" button. 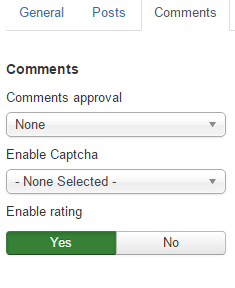 Enable rating will allow registered users to rate posts using a simple thumbs up or down system. With Enable guest view you can allow guests to view posts. Blog Factory features a lot of Bookmarking sites (Digg, Twitter, etc. ), from here you can toggle Enable bookmarks to make them available for usage. 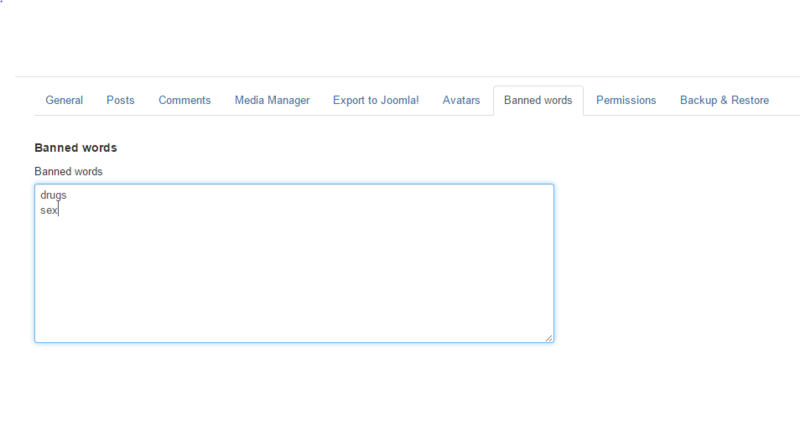 Add on the Whitelist tags field separated by comma, the tags users will be allowed to use when writing posts. From the Integrations area you can select from other theFactory Extensions installed on your site. 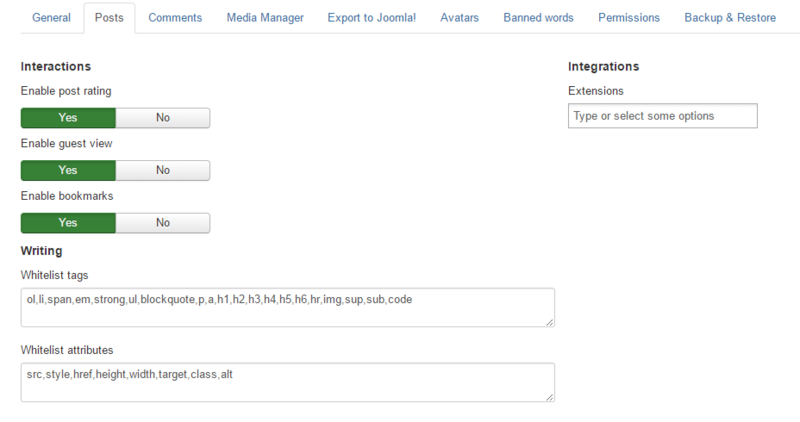 This integration will allow your users to include content from other extensions into their blog posts. From the Comments approval field you can select if comments need to be approved. You can choose to give this responsibility to Administrators only or to Blog owners as well. In case guests are allowed to view posts you can also allow them to write comments on them by enabling the Enable guest comments option. Permission will also need to be enabled for this. It is highly recommended that you enable the Captcha feature for comments if they are enabled to avoid unwanted bot spam. To do this you will need to select the Captcha - ReCaptcha plugin from the dropdown menu and to configure the plugin from the Extensions/Plug-in Manager by adding a Public and Private key. To retrieve these 2 keys head over to the Google reCaptcha website and follow the instructions found there. Limit field allows you to set how many comments to be displayed per page, adding more than the set limit will create pagination. You can also select how the comments will be ordered on the list, either by Newest or by Oldest. Here you enable Pingbacks, these can inform other bloggers whenever they cite an article from another site in their own articles. All this ensures that online conversations can be maintained with ease among various site users and websites. You can use Update Services for this, by enabling the option, and when a new post is made, a ping is sent using Ping-o-Matic! which is a service that pings several different search providers all at once including Technorati, My Yahoo!, Google Blog Search. With Blog Factory every user will have their own folder where they can upload and manage their files and add subfolders to sort them properly. Toggling to Yes the Enable user folder option will allow users to upload files on these folders which can after be inserted into posts. User folder quota will allow you to set the type of limitation used for uploads on the user folders. You can either set it as Unlimited meaning that no restrictions will be used or by By Group which will require you to set on the right side of the page the quota, in MB, for each group. 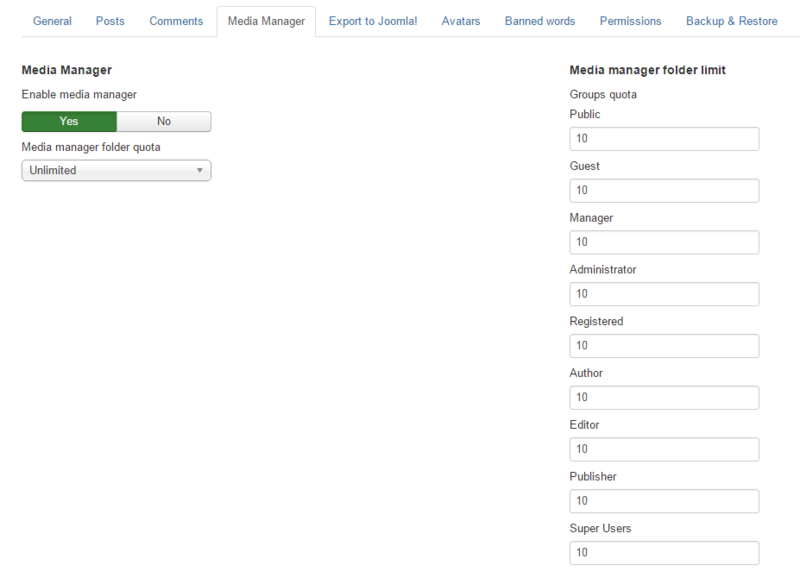 While the blog content is a part of Blog Factory, this can also be exported into Joomla's content. From this tab you can modify the default values regarding the exporting of content but you can also overwrite them for each blog individually if you choose to. With Enable export set to "Yes" you can select the category where new content will be exported, their state, access level, language and also their featured status. This section allows you to enable and set the available choices that users have when selecting an avatar. Enable Avatars will allow you to upload an avatar from your HDD and, if enabled from the settings below, to add a Gravatar or a CB avatar, the later will require you to have Community Builder installed. The avatars Maximum height and Maximum width in pixels can be set from here as well, the uploaded images that are bigger than the set values will be resized to those exact values. On the text field found here you will be able to add words which will be considered banned and censored when used by users or guests on comments. Add one banned word per line. These will be replaced by "*" characters. 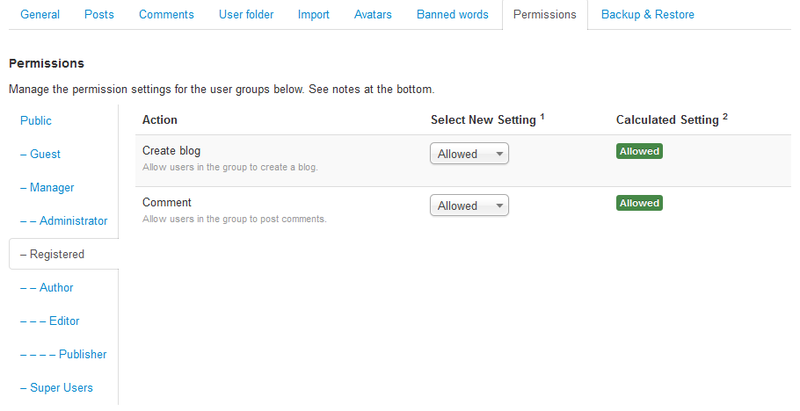 From the Permissions tab you can manage which user groups are allowed to Create blogs and which are allowed to post Comments. You can change the permission from Inherited which will use the parent group's setting to either Allowed or Denied. 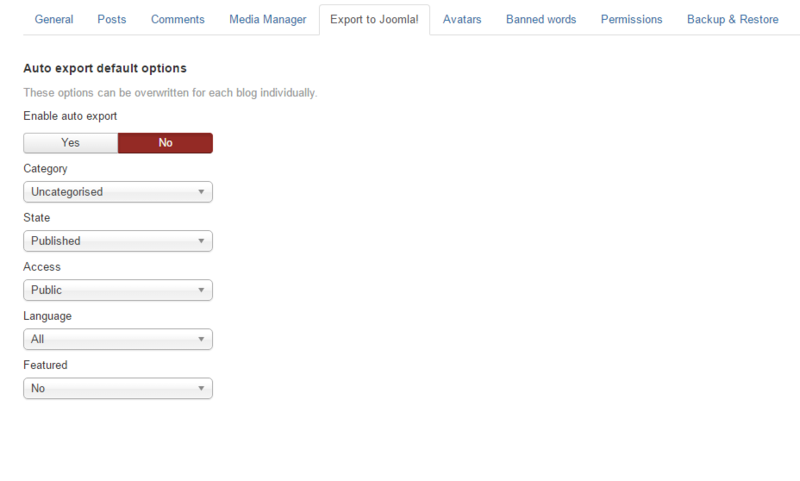 By default, Blog Factory comes with all user groups unable to create blogs or post comments, except for Super Users. Be sure that you change this by selecting Allowed for Registered user group or any other user group that you think it deserves these rights. By changing a setting for one of the actions, you will need to Save to refresh the calculated settings. You can backup the blogs and the posts found in them from this tab. Clicking on Create backup will create a ".zip" file which you can later use to Restore backup. To save the media files like avatars, user folders and more, you will need to manually backup a specific folder which target can be seen above the Create backup button.